While we’d love to embrace all of Mother Nature, some of her children are better to avoid. 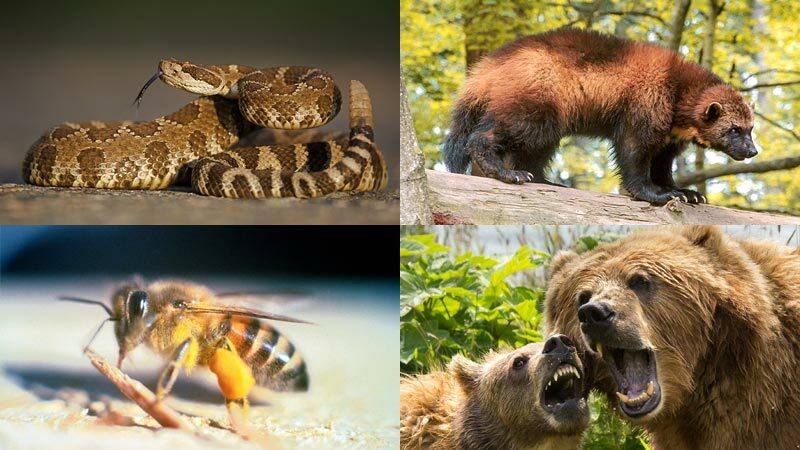 From reptiles to mammals to insects, we’ll take you through the most dangerous animals in North America. In North America, many of the most dangerous snakes are known collectively as pit vipers. Three of those snakes are rattlesnakes, cottonmouths and copperheads. Another common snake to avoid is the coral snake. Rattlesnakes are extremely aggressive, but they have decent manners – they’ll warn you with their rattle before they strike at you. Cottonmouths are much less aggressive than rattlesnakes. They’re more likely to flee than to attack and will give you plenty of warning through hissing, vibrating and emitting a nasty odor. Copperheads fall between the previous two snakes in its reaction to humans. It won’t attack or flee, but will rather freeze and stay hidden. Though if you step on one or get two close, it will bite. The coral snake’s colorful pattern is easier to spot. Because some non-venomous snakes are known to mimic the colors, it’s a good idea just to avoid any red, black and yellow snakes. Don’t let Winnie the Pooh and Yogi fool you, real bears are much more dangerous than their honey-loving, picnic basket-stealing cartoon counterparts. Black bears are smaller than polar bears and grizzlies, and will most likely run up a tree or try to scare you rather than attack. However, they’re still very dangerous and not as cuddly as they look. Grizzly bears, and their subspecies the Kodiak, can be very aggressive, especially when they think their cubs are in danger. It is said that these bears can shatter bowling balls with their jaws. Polar bears are the largest land carnivores in the world. While they rarely attack humans, they are a danger to most animals nearby, including seals, birds and even whales. Gray wolves are the largest wild members of the Canine family. Compared to domestic dogs, wolves are faster and stronger, able to break bones with their teeth. They’re able to cover more than 15 feet in a single leap. What makes them more dangerous is that they live and hunt in packs. Luckily, wolves are not known to attack humans. There is often debate about which spider is more dangerous: the brown recluse or the black widow. While black widows can be deadly to the very young and very old, the effects of a brown recluse bite can be highly dangerous and deadly to all ages. Their bite, while not painful initially, delivers the potentially deadly hemotoxic venom. Most bites from brown recluses will cause itchiness, fever and nausea, but in some cases, victims have experienced kidney failure and seizures. The mountain lion, commonly referred to as cougar or puma, is the largest cat in North America. They typically attack by ambush, climbing trees and pouncing from above. They only attack humans when starving or threatened. Coming face-to-face with a mountain lion can be tricky: running away will cause them, by instinct, to chase, while being still will make you look like easy prey. Alligators aren’t known to go after humans, despite common misconceptions. They do tend to eat anything that comes their way, from fish to frogs to birds to deer. They may not look it, but alligators are extremely fast on land and in the water. While not quite as big as a grizzly bear, wolverines have the confidence and aggressiveness of much larger animals. They have no fear and will attack animals without regard to their size. There are reports of wolverines taking down bears. Those who frequent deserts in the Southwest have a well-founded fear of the Arizona bark scorpion. Though only about 3 inches long, it’s extremely dangerous. Its venom can cause paralysis, trouble breathing and severe pain. Thousands each year will report scorpion bites, but not many bites will be fatal. Africanized bees, often called killer bees, aren’t very scary, unless you’re allergic. Unlike honey bees, killer bees attack in swarms and will chase you up to a quarter mile if their hive is threatened. Each year, around 50 people die from bee venom. Whitetail deer may seem out of place on this list, but they cause more human deaths each year than most of the predators listed before them. This is due to their ability to cross the road at inopportune times and cause traffic accidents. Next Next post: How Will You Decorate Your Dream Cabin?